Over the years, Kyle Naber and his dad, David, have watched a lot of exciting basketball and football games together. But they agree that this year’s UW-Eau Claire Homecoming football game, despite a Blugold loss, was their best game yet. 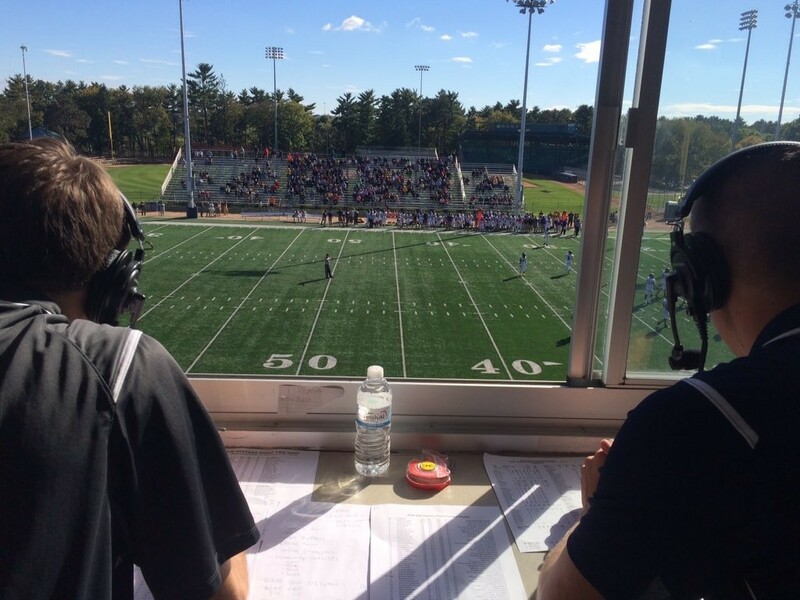 UW-Eau Claire grad David Naber and his son, Kyle, shared announcing duties during the 2016 Blugold Homecoming football game. Kyle is a current student majoring in communication studies. 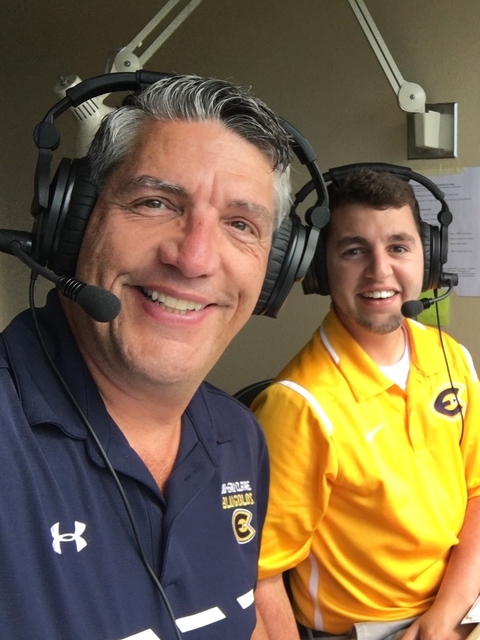 The father-son duo — the father an accomplished UW-Eau Claire grad and the son a successful student — sat side-by-side in the Carson Park press box as they worked together to announce the Blugolds' Homecoming football game. “Anytime a father and son have a chance to work together and create memories together, it's an awesome thing,” says David, who graduated in 1986 with a degree in computer science and now works as a software developer for the Department of Veterans Affairs. 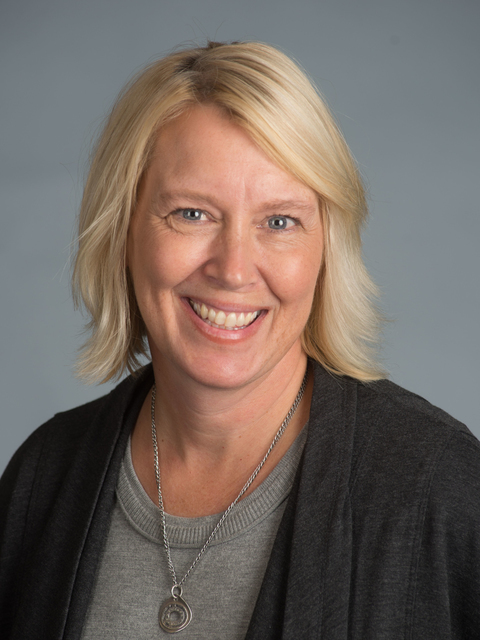 “I loved my college years at UWEC, and have a lot of fond memories of the people I met and the experiences I had. Kyle, a junior communication studies major from Muskego, has been announcing Blugold sporting events for nearly two years, first for TV-10, the campus’ student-run television station, and now for Blugold Radio, the university’s recently acquired radio station. Kyle Naber spent Homecoming 2016 with his parents, Mary and David Naber, both Blugold alumni from the Class of 1986. 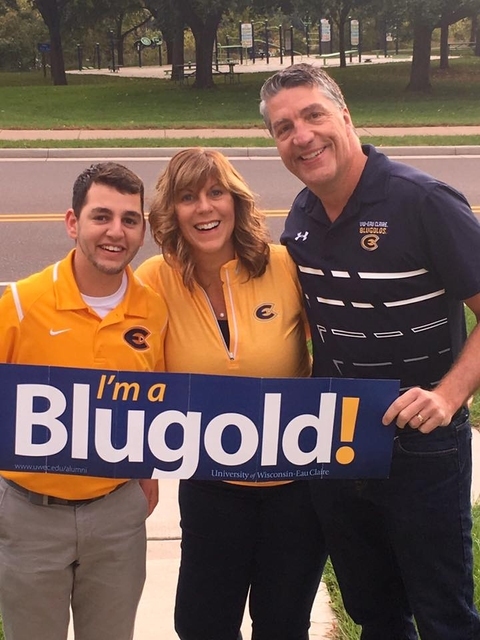 Knowing his dad and mom, Mary, also a Blugold alum, were coming to Eau Claire for Homecoming, Kyle was quick to offer his dad’s services when he heard there was a need for an extra announcer for the game. Coincidentally, while three of the four Naber family members are Blugolds, Kyle’s sister graduated from UW-Stevens Point, the Blugolds’ opponent in the Homecoming game. Always an avid sports fan, Kyle loved to play sports as a boy. But his interest in announcing came about in an unexpected — and nearly tragic — way. Kyle was just 3 years old and living with his family in Egypt when he was diagnosed with leukemia. He returned to Wisconsin, where he was treated at Children’s Hospital in Milwaukee with experimental drugs. Eventually, he had a transplant, with his mom as his donor. The only lasting side effect of his cancer treatments is that he stopped growing much sooner than expected. So instead of being 6’6” as his doctor had once predicted, he’s 5’7”, he says. “I used to have a hard time with this, but I'd rather be 5'7” and living than 6'6” and dead,” Kyle says. “I was once the tallest kid in my class. I was a decent athlete, and then I never grew. I loved to play sports, but I knew at a young age I would never go pro. It was after his freshman year in high school that Kyle decided his days playing basketball were over. Fortunately, it was about that same time that his dad and a neighbor began a new venture: live streaming local sports. At the time, Kyle’s only broadcast experience involved muting his computer so he could be the announcer during the electronic baseball and football games he liked to play. But once he began announcing the real-life high school basketball games with his dad, he was hooked. His dad still calls the football and basketball games in his hometown, and Kyle still occasionally joins him in the booth when he’s home. Of the nearly 75 games he’s called with his dad, Kyle’s longtime favorite had been a high school basketball game at the Bradley Center in Milwaukee, when a team won on a last-second buzzer beater. Not surprisingly, this year’s Homecoming football game is his new favorite. While he was in high school when he discovered his passion for announcing, Kyle’s interest in public relations began even earlier. He was in third grade when his family took a trip to Toronto, where they visited a family friend who is head of PR for the Toronto Raptors basketball organization. By the time they left Toronto, Kyle already was dreaming of a career in sports public relations. His broadcasting experience with Blugold sports has reinforced his goal of pursuing a career in public relations with a professional sports organization. Kyle continues to be involved in TV-10 programming, but he’s enjoying the opportunity to announce more games to an even bigger audience through Blugold Radio. This fall, he’s been traveling with the football team, announcing every game for Blugold Radio. Top photo caption: TV-10 transforms Carson Park's press box into its mobile production center to present the livestream of Blugold game day. Judy is an IMC storyteller, sharing stories about the many exceptional people that make UW-Eau Claire such a phenomenal place. 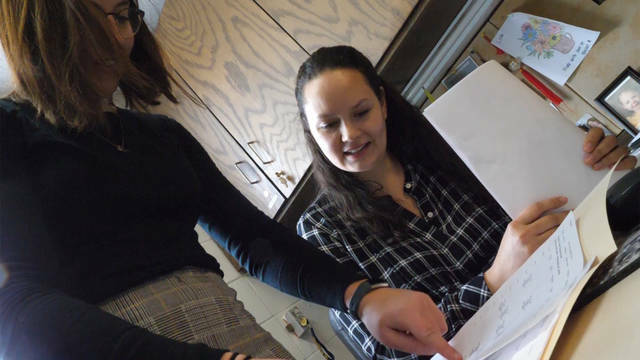 She talks with students, faculty, staff and alumni to find and to share their successes, initiatives, challenges and dreams with the campus community and the world beyond. 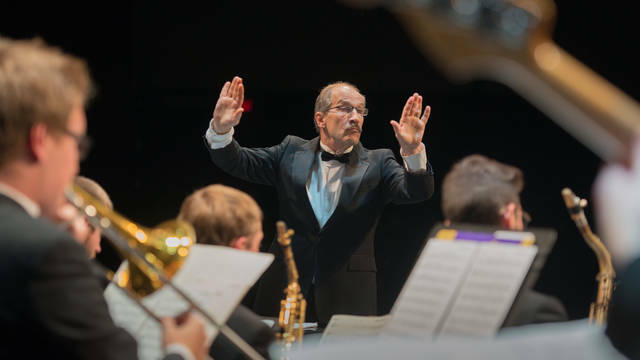 Through a significant gift in support of the UW-Eau Claire jazz program, the Margaret and Jack O'Farrell Director of Jazz Award has been established and awarded to Bob Baca, professor of music and director of jazz. 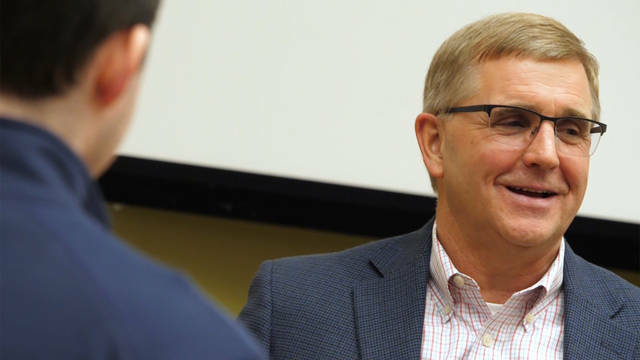 In the monthly video series "Engaged with UW-Eau Claire," the Alumni Association is proud to profile Blugolds who return to campus and make a difference. Each video features a Blugold alum who gives back to UW-Eau Claire in some capacity. The former Blugold volleyball athlete shares with students about her undergraduate experience and the importance of engaging in experiential learning opportunities that that can help them develop into a better version of themselves.